Addictive Drums is a drum production instrument plug-in from XLN Audio. 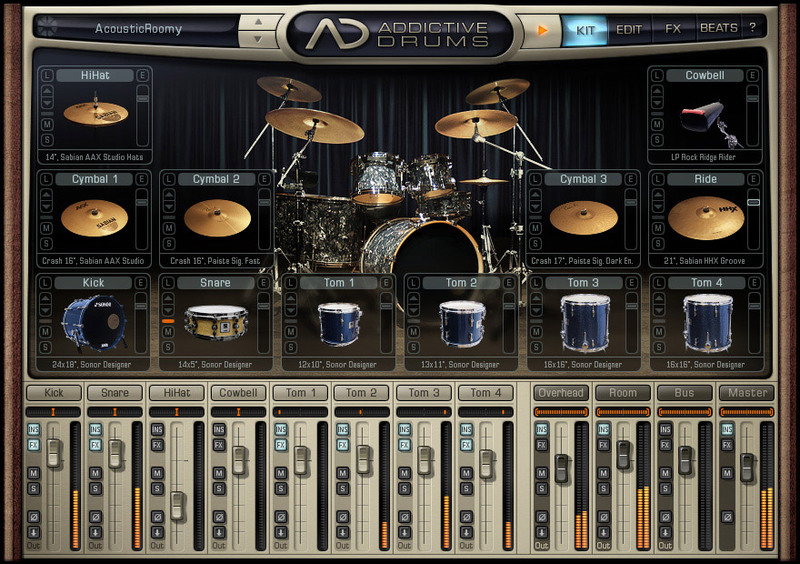 Addictive Drums is a Complete Virtual Drum Production Studio. It is very flexible and intuitive, allowing you to enjoy creating life like drum tracks very quickly. The learning curve of using the Addictive Drums is one of its primary advantage. The Addictive Drums plug-in comes with 3 complete drum kits, with a number of extra drums and cymbals. The samples are well captured, and it details every dynamic and nuance variations, from the softest to the hardest stick hits. It also includes variation of strikes (hihat has 12 variations, snare has 6 for example) with samples alternating through-out to make sure your drum track behaves and sounds human like. All sampled drum/cymbal sounds are captured professionally with a multi channel mic setup, just as you would record a real drum kit.